In order for a classic web page to respond to a users input, an HTTP request needs to be sent to the server. The server processes the input and replies with an HTML page. Thus the entire page needs to be reloaded in order to provide a response to the user. This request/reply model can be tedious for a user. 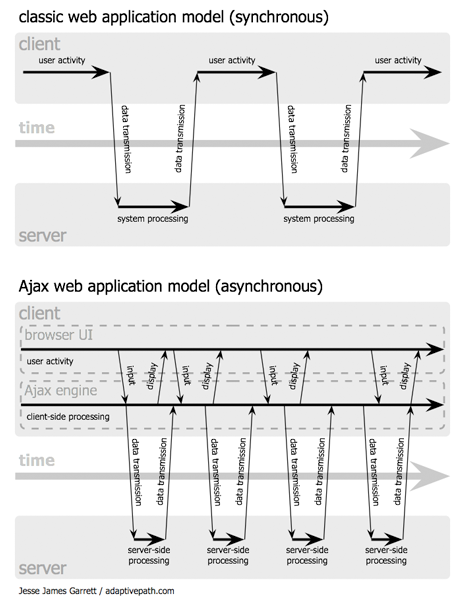 Ajax proposes a different model.Using the Ajax method a script can send asynchronous HTTP requests from the browser to the server. The script is notified when the response arrives at the browser, and can process the response. Units of data can be requested and processed without the user being disrupted by a complete page refresh. Garrett provides a graphical depiction of the Ajax model in the following image.